The main goal of the immune-dermatology project is to develop basic research program on vitiligo and pigmentary changes associated with skin inflammation, and to consolidate the collaboration with the department of dermatology and the clinical research program already internationally well recognized in the field. Vitiligo remains to date the major depigmenting disorder with a real social impact and without effective treatment. The classical hallmark of vitiligo is the disappearance of melanocytes. While several theories have been proposed to explain the pathomechanism of the disease, intrinsic defects of melanocytes with local increased production of ROS, associated with an exaggerated immune response, appear important. In accordance, we aim to decipher the role of the immune response leading to melanocyte loss, particularly on the function, survival, and adhesion of melanocytes. Understanding the interplay between the immune response and the deregulation of the function and phenotype of melanocytes will be assessed. This interaction between the immune response and melanocytes will be better studied using epidermal reconstruction with melanocytes and in-vivo models, which has allowed the modelization of the melanocytorrhagy hypothesis formulated by our group in 2003. The impact of the immune response in vitiligo will be based on the new concepts of skin immune surveillance. 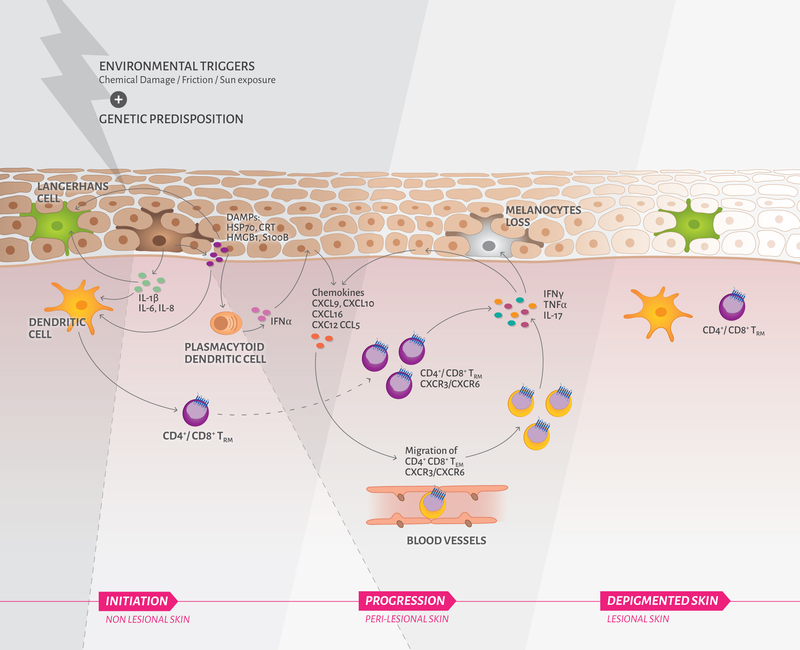 Several immune cell types populate human healthy skin, including dendritic cells, which have a crucial role at the interface between the environment, the epithelium, and adaptive immune cells. In addition, recent progresses have been made in the description and function of skin immune T cells and the newly described skin resident effector memory T cells (TRM). Skin TRM are characterized by the expression of CD69 and CD103 and have the capacity to locally proliferate in skin, and produce large amount of multiple cytokines under local stimulation. Precisely, our project investigates the role of T, especially TRM cell subsets and the soluble factors produced in the process leading to melanocyte loss in vitiligo through both clinical and fundamental research studies. A particular attention is given to the phenotype and function of these cells. Ultimately, our goal, based on our ongoing research, is to define a specific target that will eventually lead to novel therapeutic interventions to improve vitiligo management. Vitiligo-like lesions occurring in patients receiving anti-PD-1 therapies are clinically and biologically distinct from vitiligo	M. Larsabal*, A. Marti1* , C. Jacquemin, J. Rambert, D. Thiolat, L. Dousset, A. Taieb, C. Dutriaux, S. Prey, K. Boniface*, J. Seneschal. *equally contribution	J Am Acad Dermatol ( 2017-05 ) DOI: 10.1016/j.jaad.2016.10. Prostaglandin E2 regulates Th17 cell differentiation and function through cyclic-AMP and EP2/EP4 receptor signaling	Boniface K, Bak-Jensen KS, Li Y, Blumenschein WM, McGeachy MJ, McClanahan TK, McKenzie BS, Kastelein RA, Cua DJ, de Waal Malefyt R.	J. Exp. Med. ( 2009 ) 206(3):535-548.